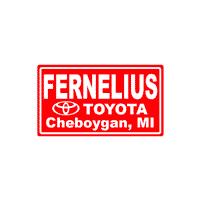 If you drive a Toyota near Petoskey or Cheboygan, MI, then take your vehicle to a dedicated Toyota service center, like the one at Fernelius Toyota, for all of its scheduled maintenance. Only a Toyota service center can ensure that your Toyota gets the quality OEM Toyota parts it deserves! Whether you drive a Toyota RAV4, Tacoma, Prius or another model, our Toyota factory-trained technicians provide the expertise and care for your vehicle that you expect. We invite you to visit our service department from Sault Sainte Marie, MI or beyond for your car’s next oil change, wheel alignment, tire service, brake pad replacement, multi-point inspection or Toyota scheduled maintenance. Thanks to our handy online service scheduler, booking a date and time for your Toyota’s next service appointment is fast and convenient. Local drivers of all makes can also contact our service staff at (231)333-3005 to schedule a service appointment over the phone, or to have any auto service questions answered prior to a visit to our dealership’s service center.